What a great day and very relaxing I must say (but after yesterday anything is :)! We went to church, out for brunch (and the kids were so good even though we had to wait an hour to eat) then over to KK's to swim and relax by the pool, a little run to the cell phone store for a new phone, and then dinner at KK's... kids asleep early and TV time with the hubby! What a great day! The only "bad" thing I left my camera battery charging at home so I could not take pictures sad... so i leave you with pictures of my sweet hand made presents my sweet "babies" made me at school and were so excited to give to me. I love some sweet handmade gifts that they work so hard on! (I got "real presents too"... but these are my "prizes". 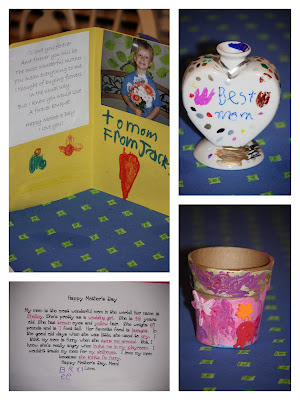 Card and Vase from Jackson, Questionaire Card and Pot from Brylee... I don't know if you can ready the Questionaire... (click on pic. to enlarge) by Brylee's answers crack me up! (for the record... don't call DHI... I have NEVER locked my child in the playroom... which was her answer to "I know my mom is angry when she... "Locks me in the playroom"... really... maybe I should try that since i am being acused of it... just kidding GoGo). I hope each of you had a very special day.... what an honor to be called "Mommy" something I could not wait to be and although it is the hardest "job" i have ever had it is the most rewarding. To all the mommies out there, to my mom, and all the special women in my life... i love you all very much and count each of you a blessing! XOXO Here's to only 9 more days til summer! Have a great week!